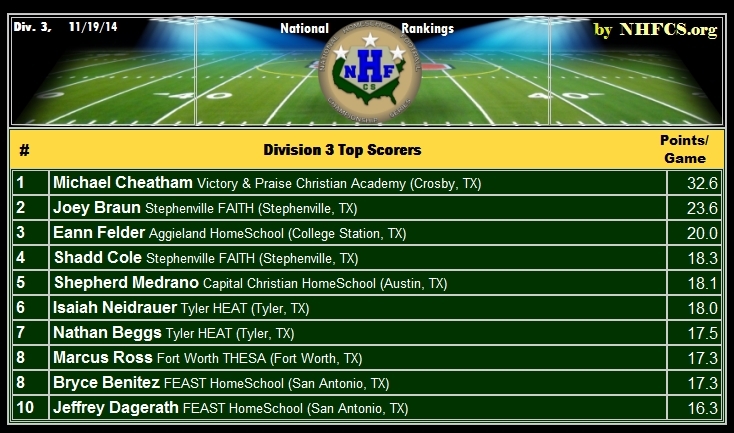 What a dramatic week for Homeschool Football! 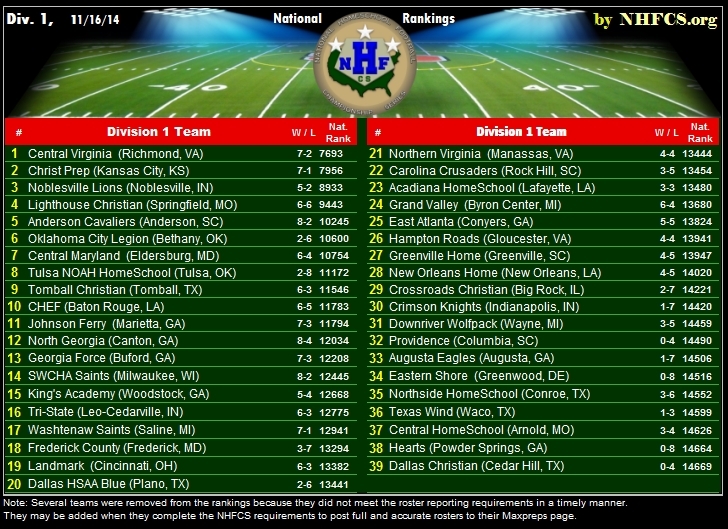 Tournaments all over the nation have been happening and some are still happening though this Saturday. 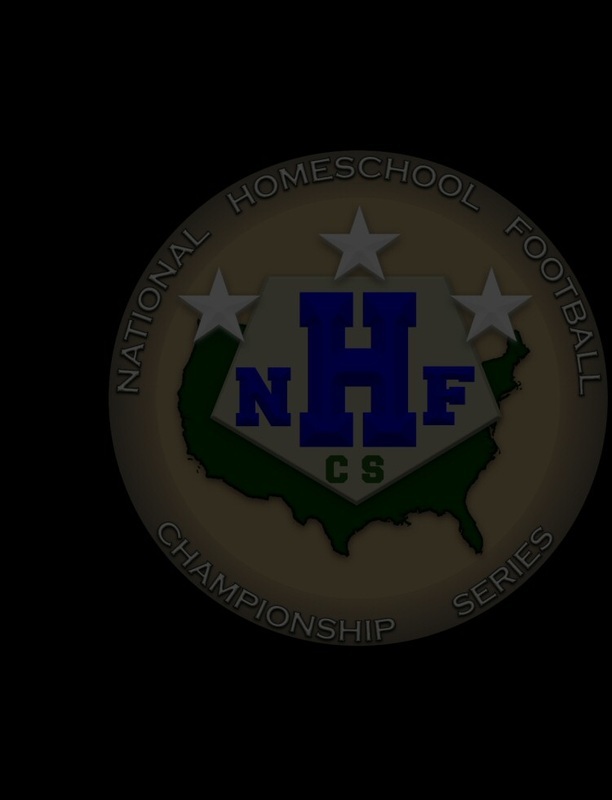 Two homeschool teams competed for a Georgia state championship in the new GICAA. 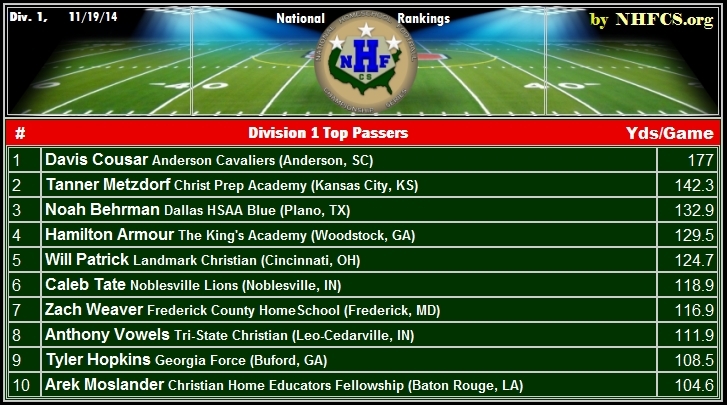 (Kings Academy defeated Johnson Ferry for the Division 2 state title). 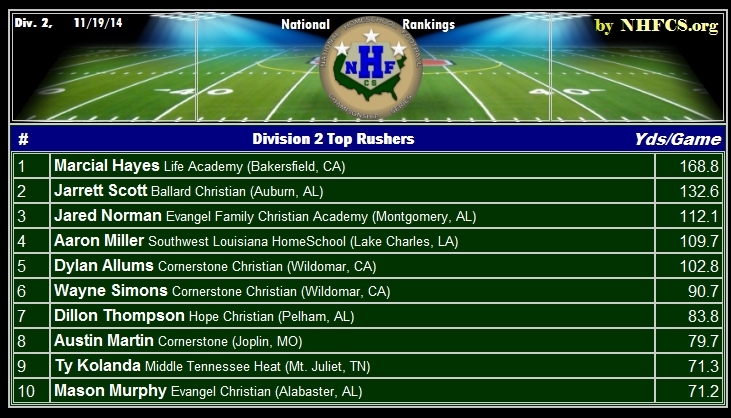 Evangel Christian was runner up in the Alabama Christian Conference. 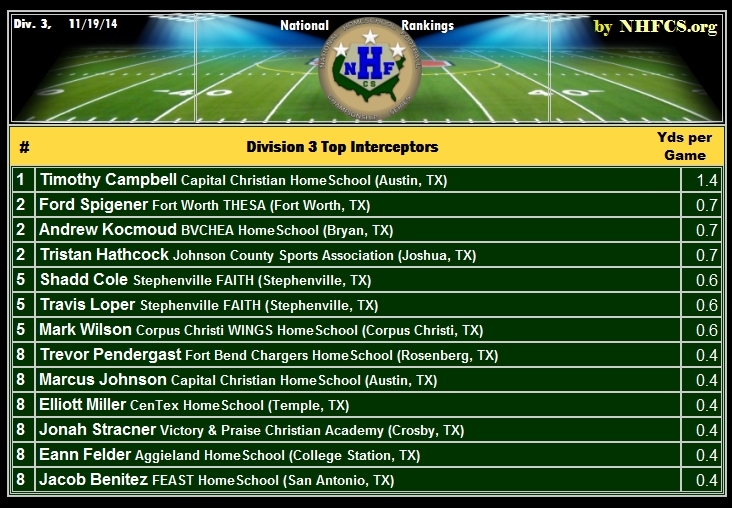 5 Homeschool teams are competing in various divisions of Texas State Championship games! 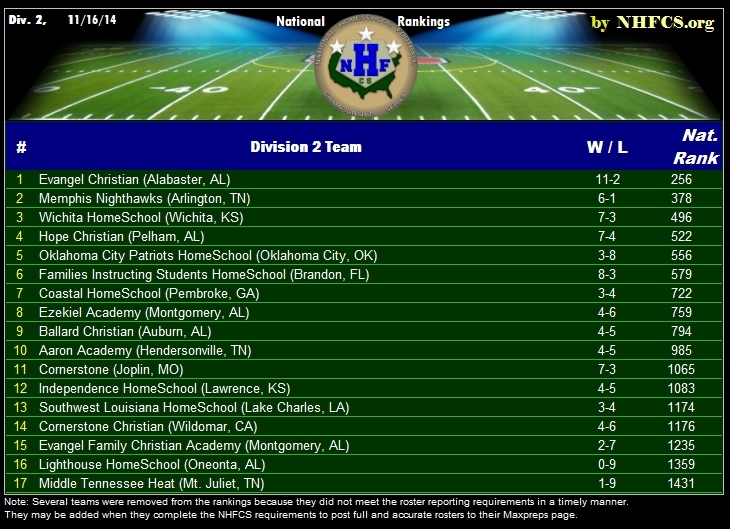 There remains some incomplete data to be added to the top teams in Division 1 rankings. 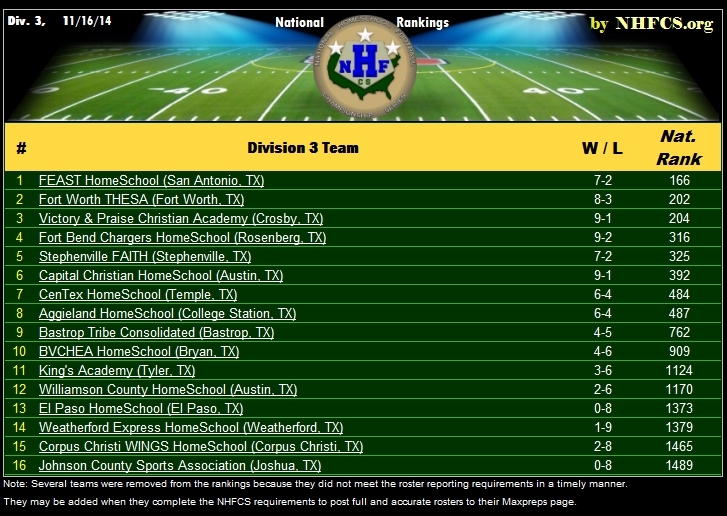 While puzzling to us all, we know the 3 teams at the top of Division 1 are all very comparable. 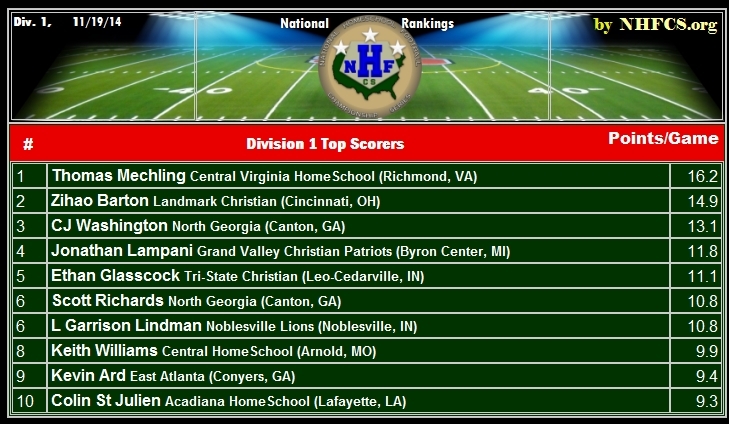 The best hunch we had for the gap between them was that the Saturday night score of Lighthouse's win over Christ Prep somehow didn't get included in the weekend's Freeman Scoring tabulations. When our analysts researched further they found evidence to support this. 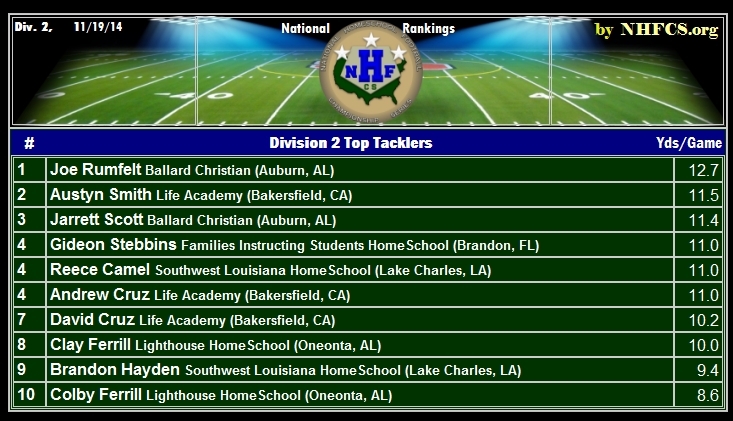 They went to Ned Freeman's own website (Calpreps.com) and checked his database. 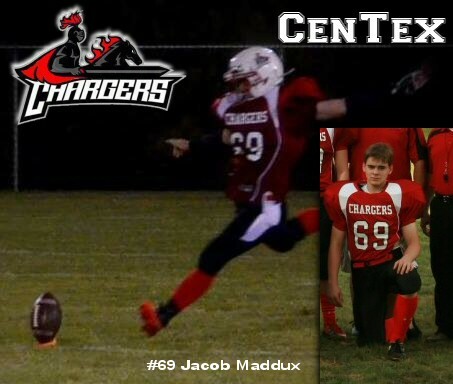 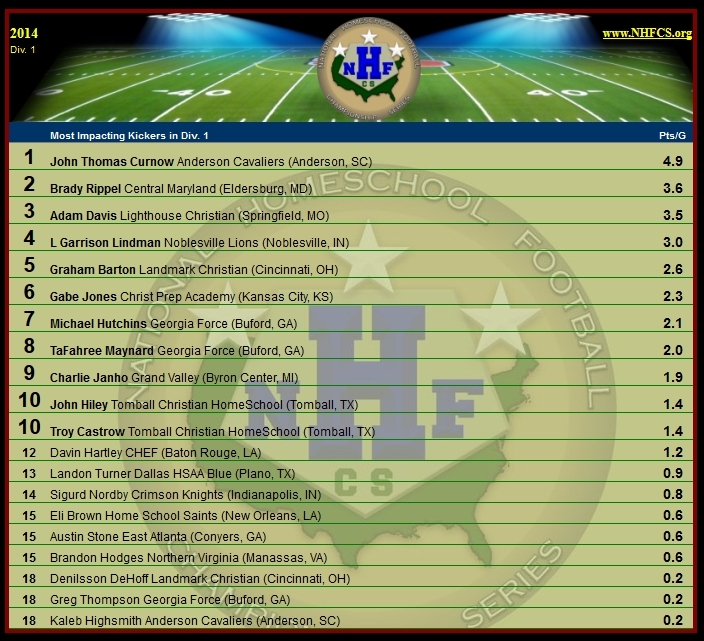 Sure enough, he only had one loss registered to Christ Prep ( to Maysville ), and not the weekend loss to Lighthouse. 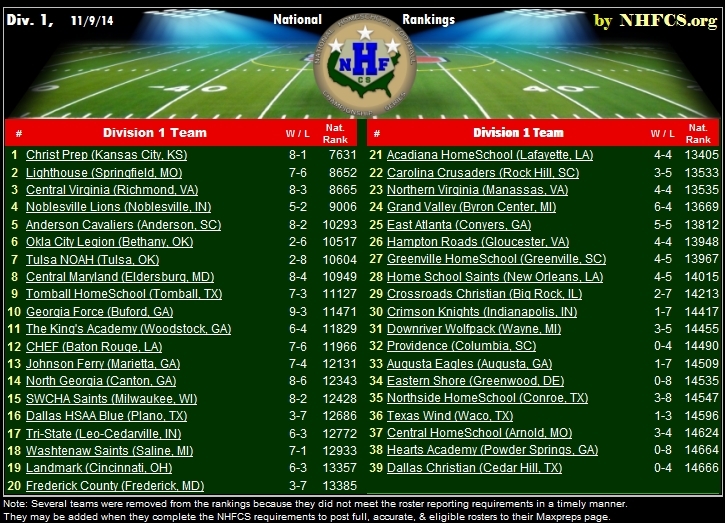 Even though the Maxpreps team page is updated, the data used for the ratings did not include the Saturday result. 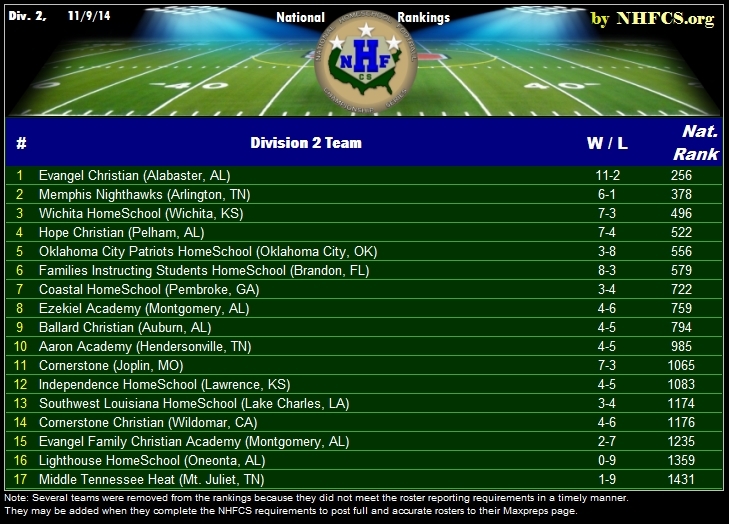 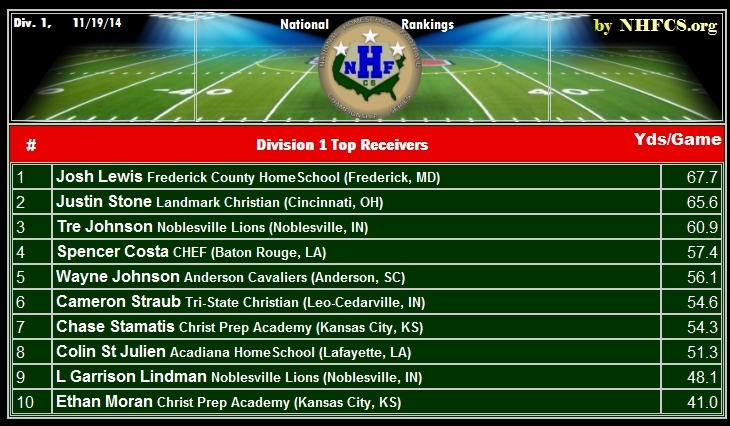 The Christ Prep power rating of 1.1 based upon an 8-1 record, and not an 8-2 record. 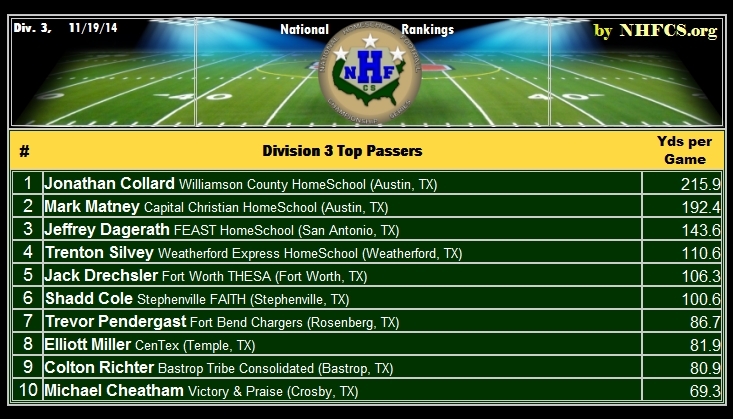 All of the teams need to not only make sure all of the data is correct on your team pages, but also check your opponent's pages to make sure they're getting all the credit they deserve; because their ranking effects your ranking. 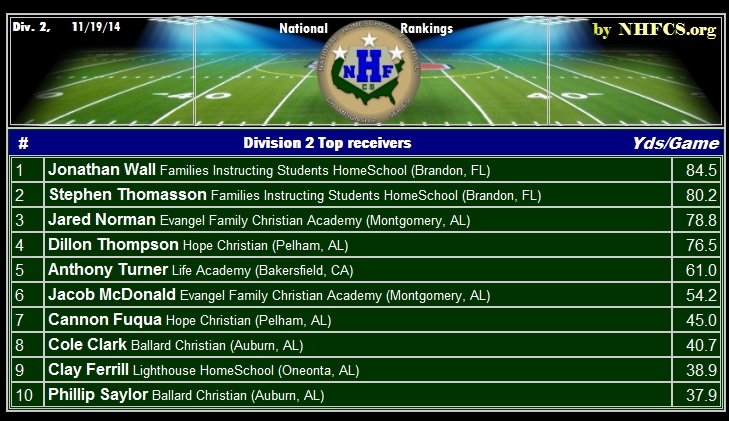 We have one week to get all this resolved. They may be added when they complete the NHFCS requirements to post full, accurate, & eligible rosters to their Maxpreps page. 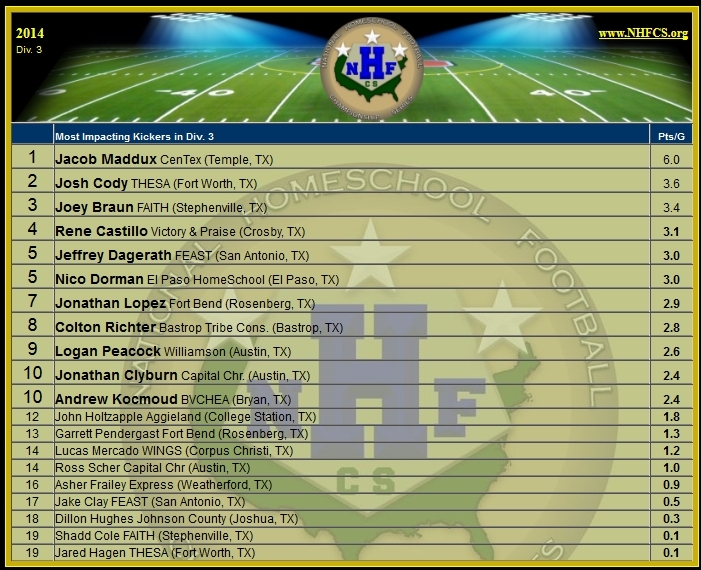 The NHFCS Salutes the Kickers. 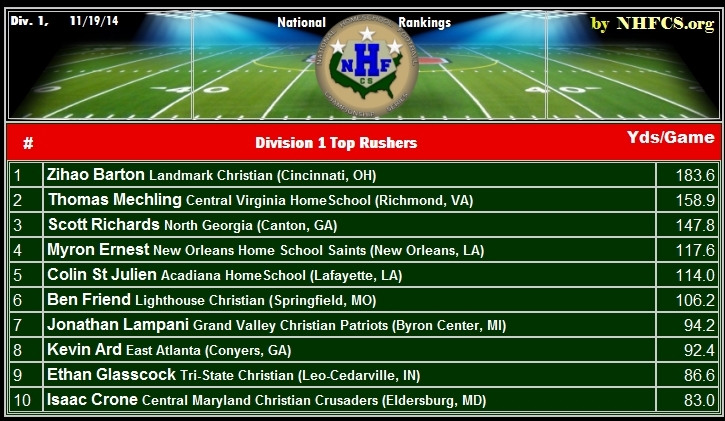 Here are the top div. 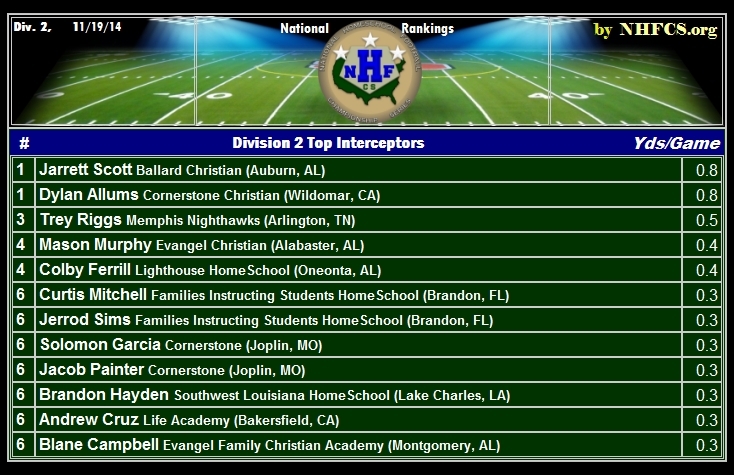 2 kickers in the nation.. 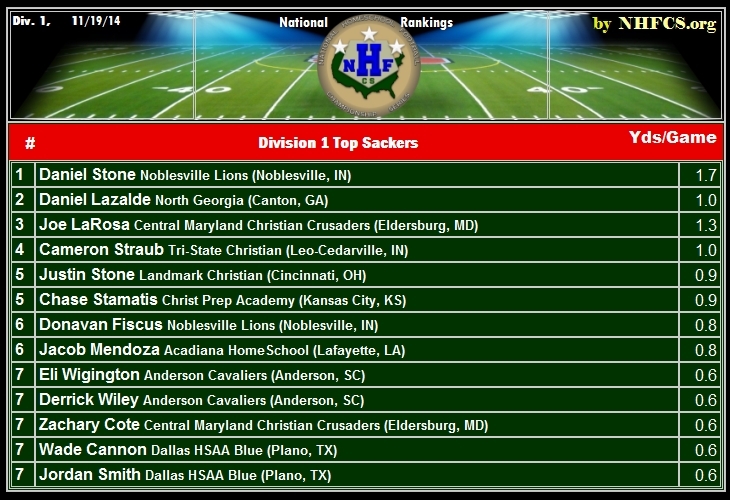 The NHFCS Salutes the Kickers. 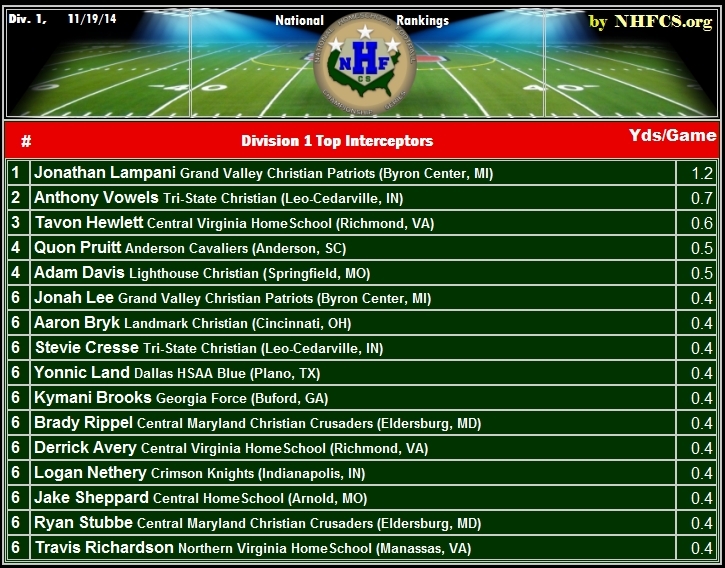 Here are the top div.1 kickers in the nation.. 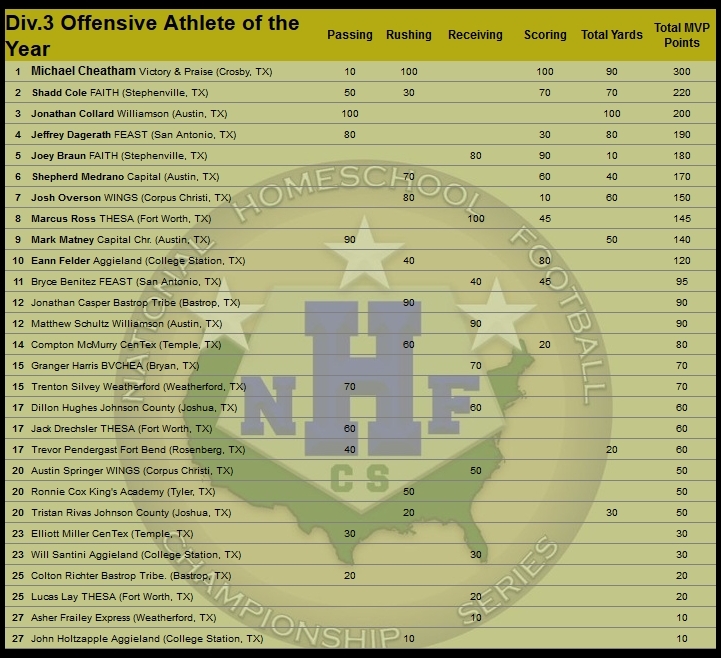 When we added up every tab and split up the points among ties, a final National Athlete of the Year emerged. 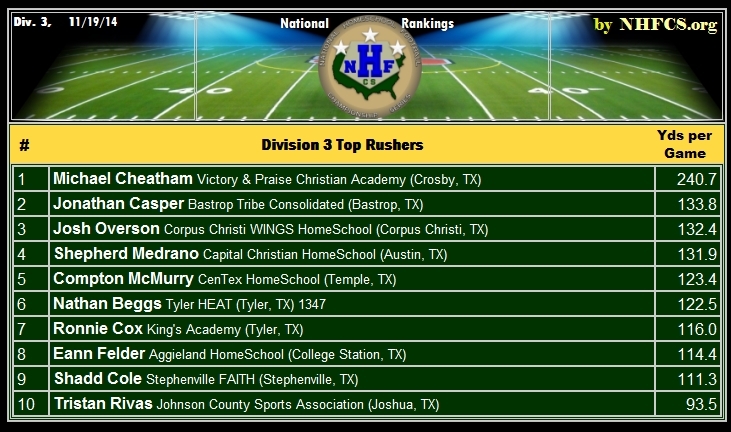 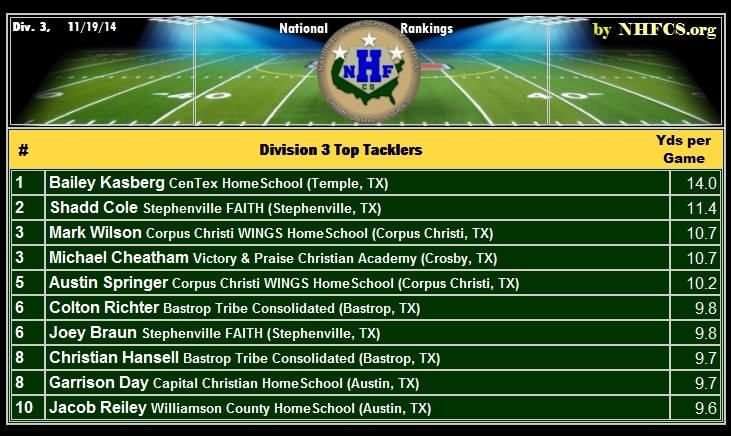 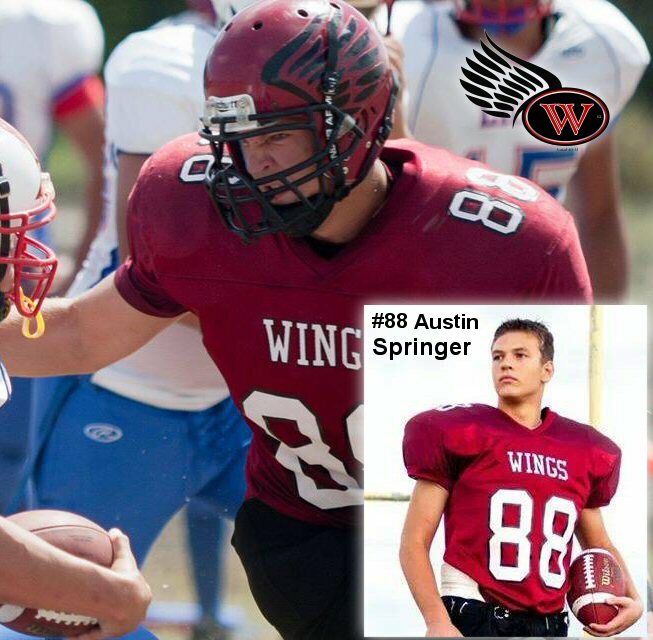 The NHFCS is pleased to announce that Austin Springer of the Corpus Christi WINGS has set the pace and is named the Division 3 National Defensive Athlete of the Year. 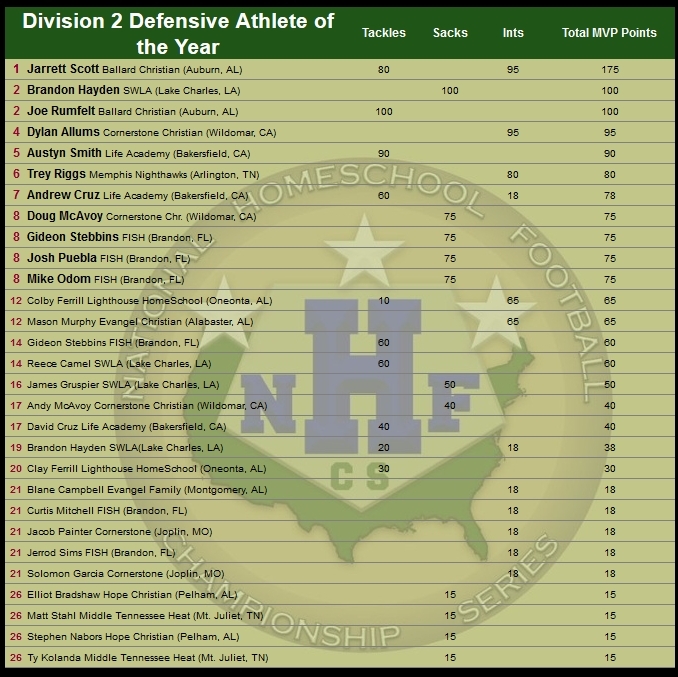 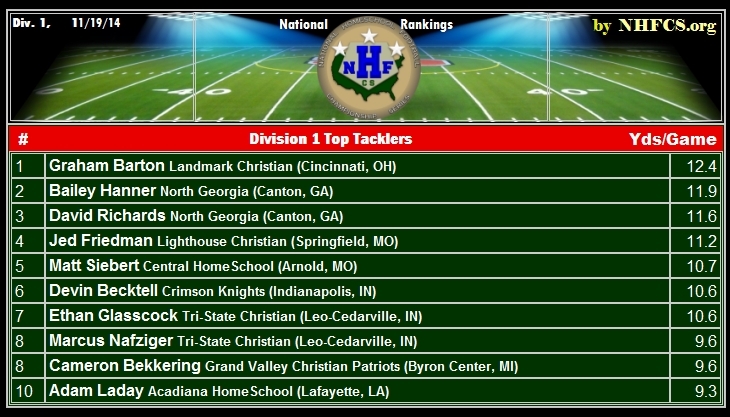 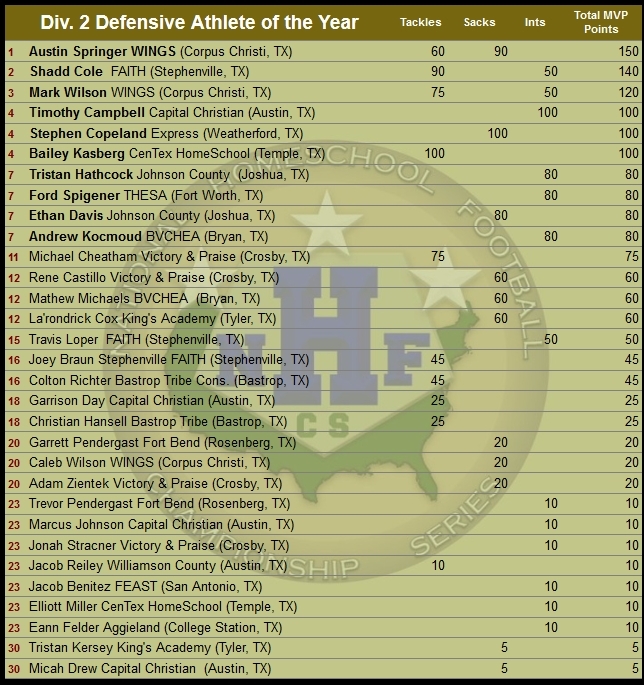 The NHFCS is pleased to present the top defensive leaders in Division 2 football. 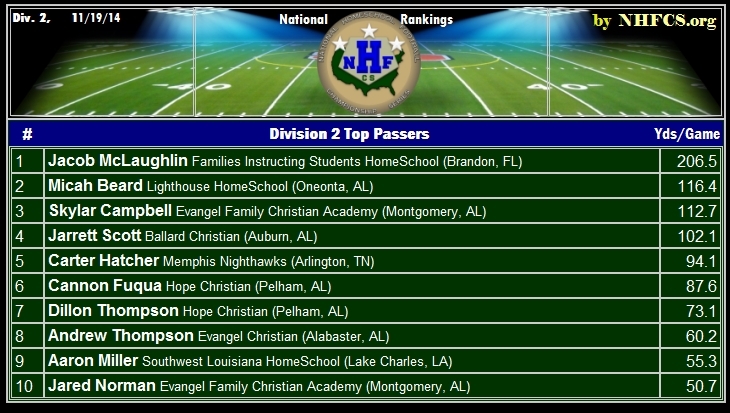 No one dominated the charts like Jarrett Scott of the Ballard Eagles. 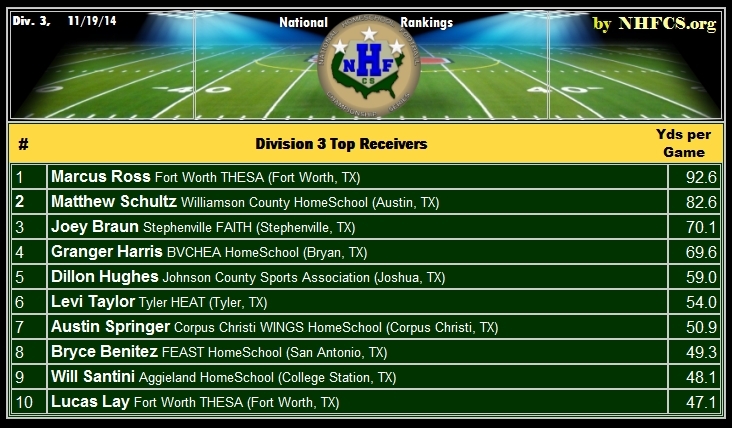 Yet right behind him was teammate, Joe Rumfelt. 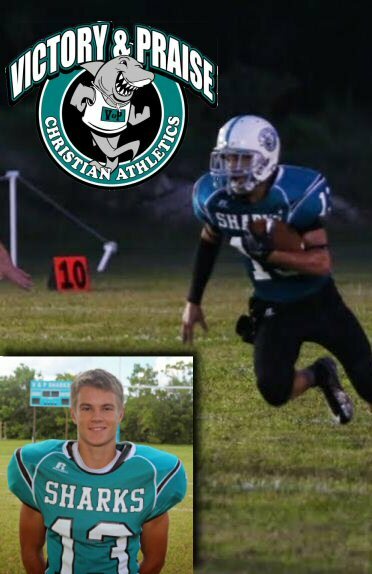 Jarrett is also noted for placing 2nd in the offensive athlete of the year, falling just short of capturing that title in a razor-thin finish. Scott leaps for the endzone.